I chose to stay at MyeongDong for my 8 days stay in Seoul. At first, I wanted to so much to try the AirBnB but the room that I wanted to book was taken by someone during my stay. So, I opted to guesthouse as I wanted to feel the crowd too. From Incheon International Airport to MyeongDong takes about 1 hour time with 43 mins travel time required from Incheon International Airport to Seoul Station, the biggest transportation hub in Seoul. Travel with AREX is cheap, it costs me about W4,900 to reach MyeongDong and you can use the T-Money card to tap and travel around. It is cheapest option to reach city. It is very convenient too. But be prepared that you have to carry your luggages around in the subway as elevator is rare. 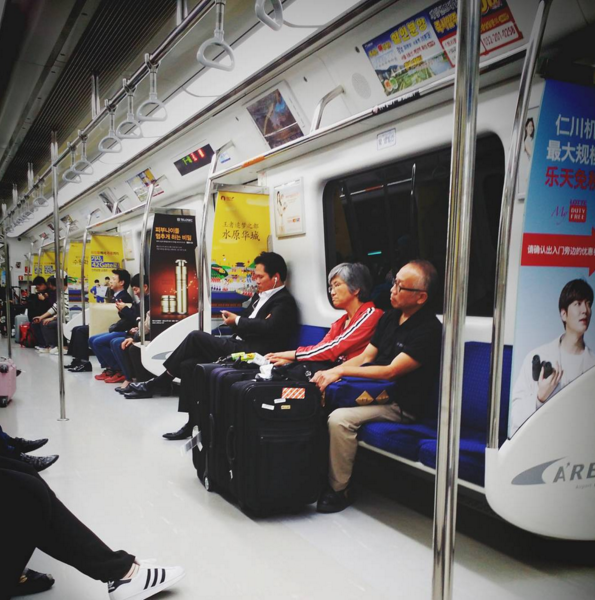 To compare this AREX with KLIA Express in Malaysia, this AREX is spacious, long trains and fast. Similarly to Singapore MRT, they have all the stations indicator and announcements in most common languages to make sure every travelers can understand it. 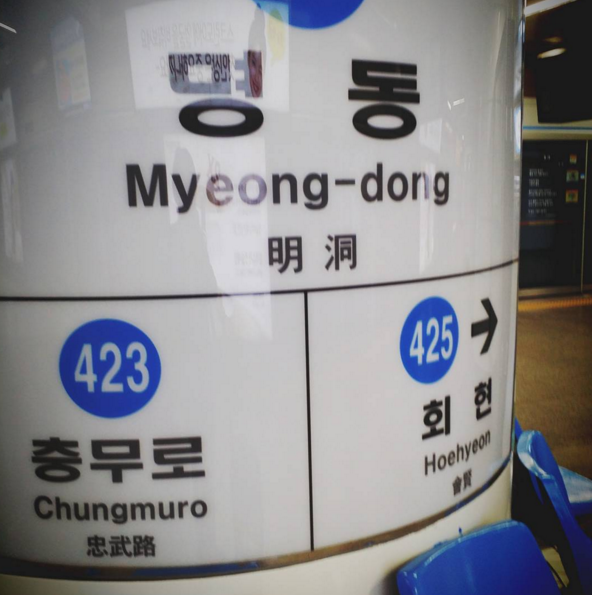 Besides that, their train stations have both Korean words, hangul (English translated) and Chinese words. It is very easy to navigate around after you get familiar with it. You can find the train systems map at almost each of the train doors. I traveled a lot to Chungmuro if I am heading down to Gangnam area, otherwise, I can easily walked to Hoehyeon station where Namdaemun is located. Some of their stations are located quite closed to each other that you can just talk from one station to another station, either by the roads or undergrounds. Do opt for underground walkways, there is where the shopping heaven is. Hey, I decided to merge both my food blog and travel blog into single blog website. Do not worry those old entries for my travel blog will not be removed and I will make a copy over here, in my food blog. It will become a food and travel blog in single website. Let us begin with my stories about my 8 days travelling around this lovely city in South Korea, Seoul. I traveled to Seoul by MAS and that means I traveled back to my home country on the Friday’s night and flied to Seoul on the Saturday’s night at 2330hrs. 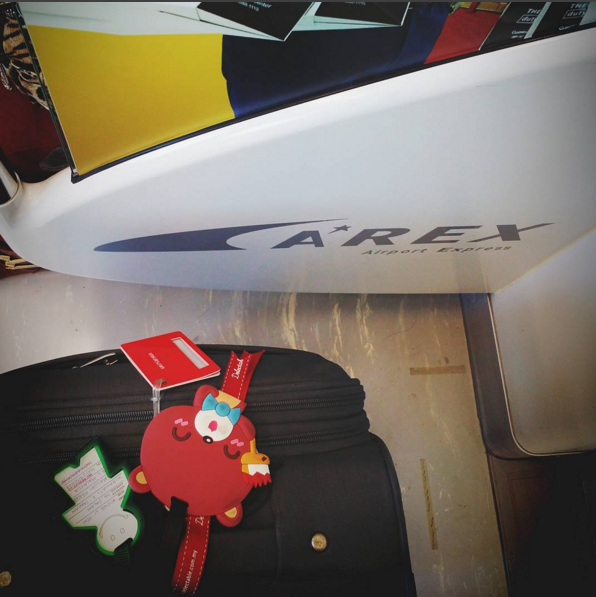 The airfare for this trip costed RM1,278 inclusive 30KG of luggage, airport tax and etc. I will not say it is dirt cheap price but when I compared with AirAsia and other budget airlines as well big airlines like SIA, the MAS came out to be reasonable price. Of course, I can always check out my bill with AirAsia with below RM1,000 inclusive of 20KG of luggage. However, it is a night flight and it takes about 6.5 hours, therefore, MAS will be great option with food and beverages and entertainment in-flight. Upon took off, we are required to fill up the immigration form from Korea and a drink was served too. The ahjussi did not ask me if I would like to have orange juice or apple juice, he just took and passed it over to me. Haha, I am fine with it though. After about an hour, I started to entertain myself with a movie before I went to nap. And, at that point of time, we were served with supper! They called it as refreshment which consisted a cup of drink, a packet of peanuts, a packet of wafer and a box of bread and muffin. It looked good and everything was just nice, okay and no complaints. About two hours before arrival, we were greet with breakfast. I chose the omelette set and as usual it comes with drinks and stuff. This time, I chose to have coffee, and it is sad… The coffee is too mild and close to tasteless. I do not know if this is to suit the Koreans’ tastes or what not, but yes, I will not ask for coffee anymore. Orange juice still the best! I was greeted with the lovely sunrise at Incheon International Airport. Throughout the whole journey, the ahjussi next to me really took care of me, including asked me for food and beverages. I felt the kindness and warm of Korean people. Two Bakers, Singapore: I joined the two lovely food lovers for lunch and cafe hopping after that. 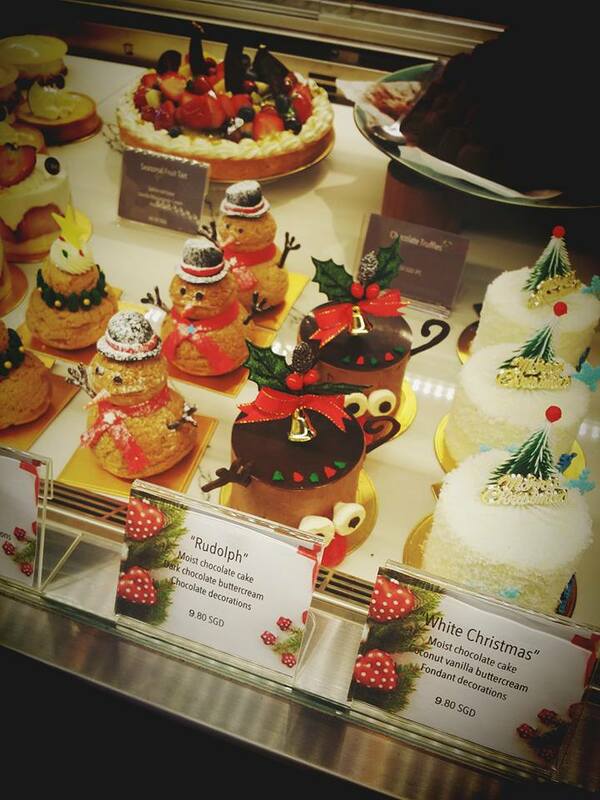 It was back in December 2015 when we went to Two Bakers to try their Christmas cakes. 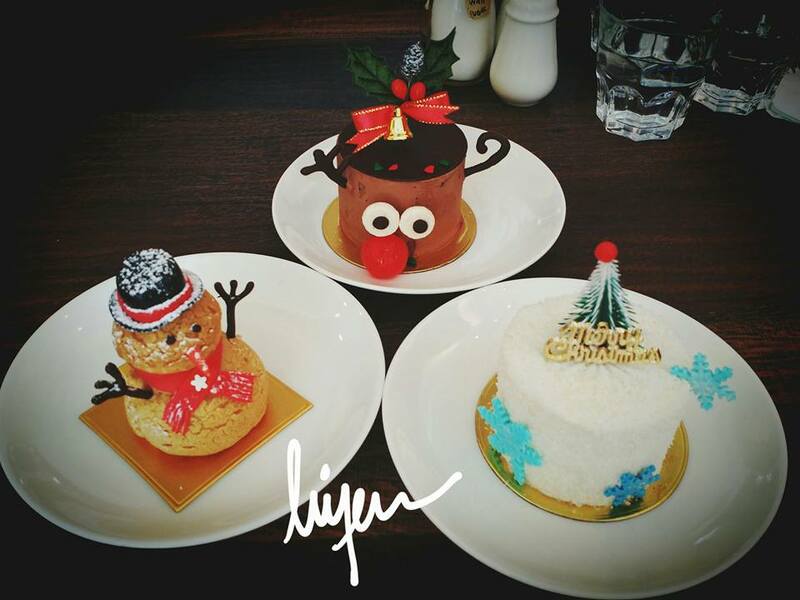 The based of the Christmas cake is the same and they have three different Christmas designs, just nice for 3 of us to try. I did take the decoration on top of the cakes back to office to decorate my monitor. I shall try their main course one day at this cafe when they reopen. I passed by the past few days before the new year, the cafe was closed. Address: 88 Horne Road, Singapore. One of the cafe hopping destination if you are around the Lavender MRT station, The Tiramisu Hero. You can try here as they offer many different tiramisu flavours. Since the medium size has sold out, my two friends ordered the large to try and I just hopped on to try one scoop as I am not really into Tiramisu and having the large one will further making me food coma. They chose the original and Horlicks flavours. The original flavour does have alcohol and the rest do not. The original is just nice. Address: 121 Tyrwhitt Road, Singapore. Lunch with two ladies who love food as much as I do. They sent me a link and I fell in love with the food here. The food presentation is pretty nice and I would like to a few food there. For my first visit, I chose the Egg benedict and the two ladies chose the Norwegian rosti. The food does not need to take very long to be served after we placed the orders. I believed the two persons in the open kitchen are the chefs here and probably the owners’ of the cafe. See how hearty the food presentation of this rosti. It is not easy to make the Egg Benedict and the pictures from the Internet attracts me to try it as my first try. Only one egg is cooked to its perfection and other one is slightly over-cooked. It comes with some vegetables and a soft bun. A unique discovery is the Luncheon Fries. It gives us a great idea on how to cook luncheon meat also. It tastes just the same as normal luncheon meat that we bought from supermarket. You can dip the luncheon meat into the special sauce or go original. Address: Kitchener Complex Blk 809 French Road #01-50 Singapore. Opening days: Mondays to Fridays. On the week before the Christmas Day, I got my friend a Christmas gift and I sent a Whatsapp message to my friend asking if we could meet up before the Christmas. Since the only available time to meet up was on the same day and I had a dinner with another friend, I asked if we could meet up for yam cha later at 10PM. Yes, my friend said okay. I rushed home at 9.30PM after finished the dinner with my friend at Tampines One and sent my friend off to the MRT station. I needed to prepare the Christmas to bring along to meet my friend. I was brought to Holland Village and I guessed it was my first time be there as I could not recognise the shops around there. I remembered I was there for a Mexican food too but I could not remember which road. We ended at this open-till-late-night desserts bar which is located at the 2nd floor of the 2 storey shoplot. It is an atas desserts bar and they have some desserts which are delicious according to other food bloggers. It is a fine dessert dining. It took us quite sometimes to decide what to order for desserts. The menu listed what desserts and pair with which wines. Yes, they do serve wine here. Finally I suggested to try the waffle together. The signature, 2am: fonffle, a 64% chocolate fondant waffle, blood orange sorbet. It is a pretty unique waffle that I ever tried. The strong chocolate mixes with the sorbet bring the sweetness to the next level and pair it with hot coffee Latte would be a good combination to neutralise it. I have no idea why, however, the waitress informed us that the minimum spending at this desserts bar is $14.00 onward when we asked for table for 2 person. Perhaps, next time we do not wear sandals out for desserts. Address: 21A Lorong Liput, Holland Village, Singapore. Opening hours: 2pm – 2am. A New York City subway train holds 1,200 people. This blog was viewed about 7,300 times in 2015. If it were a NYC subway train, it would take about 6 trips to carry that many people.